No joy. The actuator arm on the ice maker is hanging in the up position when the ice drops. I now have a new ice maker headed my way. I was surprised it was only $40 with shipping included. Right now at 7 in the evening, it's 91*. "feels like 96*" Also 58% humidity...gotta love the South! And 250 north of you it is 89* at 62% humidity that feels like 97*. I have got to wonder why Atlanta is more humid with all the swampland around Valdosta. This is just the beginning of the summer. I see that as of last night, the State of Oklahoma has jarred planet Earths axis of rotation to a new one. Congratulations! Maybe california will finally break off and go into the ocean as it should have years ago. ^^^ Along with most everything west of the Cascade Mountains. So no one has posted in here in a month hu? Time to revive it a bit. So I have a question someone may have an answer to. What all changed when the "Sport" models came out? Why does it say "highest priced" for the Sport? My sport has manual windows, manual locks, didn't come with cruise (I added it), no carpet, the crappy floor console and a 60/40 split seat. It also has no tilt wheel, no keyless entry, no running boards. So the private party value (high end) is $17,926, priced with the correct options (or lack there of). 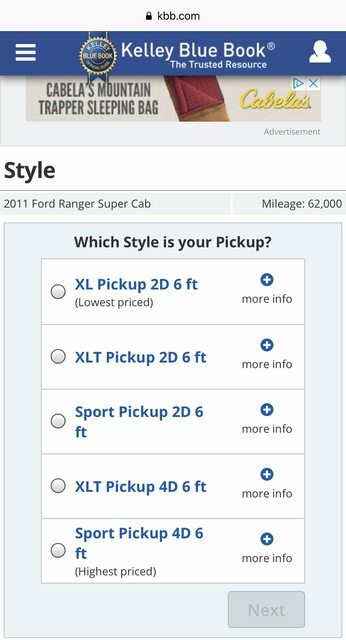 I also priced an XLT with power everything, 4x4, 4-door, 4.0, etc. Its high value was $17,964. An XLT with all the options is only worth $38 more than a Sport with no options? I guess maybe less is more. Either way, I'm glad of the value mine has. I just don't see the appeal of it over the XLTs or FX4s. Last time I priced my 07 sport 4door 4x4 4.0L it was around 8k so I had to look again... Lol yours is 2011 with 62k. Now it makes sense. Even an XLT with the same mileage is only worth $38 more though. The XLT with all the options and the Sport with hardly any. I wonder what original stockers were on the two different models. Just for fun I did it. Quite a range, $8,5k to $11k. Odd thing was when I came to the wheel selection, 'dual rear wheels' was an option! I think that's just a general option for all trucks. Maybe not though, does it increase the value? I can see guys on Craigslist using that to increase the value..."well it does have 2 rear wheels". Good morning everyone, well today we have a break in the heat/humidity & 90+° for a day or so then back to the heat for another week. Right now it is 71° & breezy, & it is supposed to only get up to 78° today. At least this is Labor Day Weekend & after Monday all the fruits & nuts will go back home & most of the crazies will be gone for another 9 months. So you are living in or near a tourist trap? When I lived in Northern Michigan (petoskey) the locals called the tourist "Fudgies" because they would buy an inordinate amount of fudge, local markets would have to stock like 10 times the fudge and smoked fish as any other time of year. After labor day the place was like a ghost town by comparison LOL. I only lived there a few years, they considered me a "transplant". Locals were called.... locals. I live 5 miles east of Seaside Heights in a retirement community & have to deal with the crazies that come down to the Jersey shore for the summer. Down here they call the tourists bennys, those people from Bayonne, Elizabeth, Newark, & New York. Well it is back to the heat & humidity today for the rest of the week. Cool looking car! 9 speakers? 1 or 3 of them are subs I bet? Odd number. Nope, no sub. The 12 speak system has a sub. the 9 speaker doesn't. My Fusion is freaking out. I am getting error messages about servicing the radiator, traction control, oil overheat, and ABS failure. This is with a cold engine. I had a radiator overflow service board recall that was accomplished last month. This is not my daily driver. I only use it on hy-way trips. Right now I don't trust it. Too add to the confusion it is intermittent. No codes. Time to think about trading it. More Fusion freakiness. No error codes stored in ecu. I am running Torque OBD full time to monitor whats going on. The car cranked without incident. Waiting or a left turn light it shut off. When starting it back up I get "service advancetrac", "Service traction control", "Engine oil overtemp", and "radiator Fluid low" and it cranks with the advancetrac and traction control idiot lights that are on. No error codes stored in ecu. I have done the google foo and all I can come up with there are soft codes for my issues even though Torque shows no impending codes. I did the soft code reset (with key in "ON" and not running, disconnect battery for 5 minutes) and I am getting is "radiator Fluid low". Last month I had recall work that involved a new expansion tank, sensors, and radiator service with new fluid. The fluid is half way up the expansion tank. Recall work on the Ranger tomorrow. When I go to pick up the Ranger I will leave the Fusion with them to sort it out. Good morning everyone. I woke up to yet another day of light rain & 63°. It looks like it will be raining in some form through next weekend. At least it is cooling off & I was able to turn off the A/C in the house & open the windows. Coffee. Good. Rained all day yesterday here.Too chicken to open the curtains today so far. Page processed in 0.3221 seconds (28% database + 72% PHP). 131 queries executed.